WICKET! That's it then, India win. Vijay Shankar has put in a World Cup spot sealing performance here. Goes through Zampa and clatters the middle stump of Zampa. India win this one by 8 runs and take a 2-0 lead in the series! WICKET! Stoinis departs first ball! Vijay Shankar might just have done the trick here for India, Stoinis looks to go for the big heave but completely misses the ball. He decides to review but it stays as umpire's call. Stoinis has to walk back and now 11 are needed from 5! WICKET! Jasprit Bumrah with the breakthrough now, Coulter-Nile looks to cut the ball but is beaten by sheer pace there. The ball goes onto clatter the stumps and he has to walk back. Delight for India. Coulter-Nile departs for 4 and run-a-ball 28 still required! WICKET! Kuldeep Yadav strikes after conceding a boundary, Carey looks to sweep the ball but gets an inside edge which rolls onto the stumps. No major celebrations though from India, is it a case of too little too late then? Still 33 required off 33 balls, but an important 34 run partnership this! WICKET! That's the big one India needed, Kuldeep does the trick as he removes Maxwell. Poor shot though as he looks to pull but the ball stays a bit low and castles into the middle-stump. Maxwell will have to walk back here for 4. Is that the game then for India? STAT ATTACK: 500th ODI win for IND only the 2nd team to reach this landmark after AUS. Half century for Stoinis, who again holds the fort for the Aussies. Interesting tactic this from Marcus Stoinis, he has chosen to play out Jasprit Bumrah and has taken just a single on the last ball. Bumrah's reputation coming into the picture one feels, this means 20 runs will be required from final 2 overs! This is turning into an absolute nail biter here, Stoinis plays one off the backfoot and slashes it past point for a boundary. He was allowed to get on strike there by some really ordinary fielding by Jadhav and then Rayudu, who was backing up. 21 runs needed from final three overs here! Kuldeep does come back into the attack here, India again looking to hunt in pairs at the moment. Wickets are what will help the hosts, if Australia do play 50 overs, they should win this game! Kedar Jadhav continues to bowl from almost behind the umpire here! Australia seem to have learnt to tackle him by playing as late as possible, they pickup 8 runs from that over as Stoinis gets a boundary. This match has all the makings of a nail biter here! Stoinis and Handscomb doing well to tick over the strike here, runs coming in 1s and 2s at the moment. Kohli also turning to Kedar Jadhav at the moment as he looks for a breakthrough! Marcus Stoinis has come out in the middle to join Peter Handscomb, but both the batsmen have their task cutout at the moment. Kuldeep seems to be in perfect rhythm and looks like running through the Aussie batsmen! Jasprit Bumrah has come back into the attack now, India sensing an opportunity here to pick a couple of quick wickets. Kohli going for all out attack with two of his wicket-taking bowlers in the form of Kuldeep and Bumrah. Can they provide the breakthrough? Shami is back into the attack as India needs to get another wicket. He has been bowling well, but a wicket still eludes him. Australia are 121/2 in 23 overs at the moment. Another over comes to an end and Handscomb and Marsh seem to be forming a little partnership. They have added 30 runs together now. Australia are 113/2 in 21 overs. Australia have brought up their 100 in the 19th over. Till now they are in the chase, but seeing the nature of the wicket, it will be tough for them too. It's 106/2 after 20 overs. India vs Australia, Latest Updates: Marcus Stoinis has come out in the middle to join Peter Handscomb, but both the batsmen have their task cutout at the moment. Kuldeep seems to be in perfect rhythm and looks like running through the Aussie batsmen! Catch all the live action from the second ODI between India and Australia at Nagpur. Preview: "This is good," was Virat Kohli's reaction when India found themselves on 99/4 chasing a modest 237-run target in the first One-Day International against Australia in Hyderabad. That they achieved the target without losing any more wickets would have pleased the Indian captain no end. These five ODIs are India's last few games before the 2019 World Cup and are going serving as a precursor to the quadrennial event considering most members in the current squad are likely to take the flight to England in May. Having lost the two-match T20I series 2-0, India were desperate to get back to winning ways in the series opener at Hyderabad. They gave a good account of themselves restricting Australia to a below par 236/6 with Mohammed Shami and Kuldeep Yadav being the pick of the bowlers. In the chase then Shikhar Dhawan (0), Rohit Sharma (37) and Virat Kohli (44) failed to fire as India looked in a bit of strife on a tough Hyderabad surface. But Kedar Jadhav (81*) and the ice-cool Mahendra Singh Dhoni (59*) forged a defiant unbeaten 141-run stand for the fifth wicket to help their side through to a six-wicket win. Going into the second ODI in Nagpur on Tuesday (March 5), India will be hoping for a similar show from their players on what is expected to be a good surface for shot making. Kohli singled out Shami and Jadhav as the big plusses from the first game. Shami hasn't been a regular in the 50-over setup but since his return has looked menacing and is even touted to pip Bhuvneshwar Kumar into the playing eleven as Jasprit Bumrah’s new ball partner. The right-arm pacer who is looking lighter and quicker has returned 15 wickets from eight matches since his return to ODI cricket. He hasn't given anything away in the top ten overs and in the death as well has looked more than a handful. On the other hand, if Jadhav can produce performances anything similar to what he did in Hyderabad, it solves a lot of Kohli's headaches. He bowled seven overs conceding just 31 runs for a wicket and then with the bat produced a measured 81* to see his side through. India have struggled with their sixth bowling option in recent times and Jadhav is increasingly appearing to be the man ideally suited for the role. One area of concern for India though will be Shikhar Dhawan's form. In his last 15 innings, Dhawan has only managed two half-centuries at a strike-rate of 82.95. There have been seven scores below 20 and two first-ball ducks. Certainly not ideal for India's premier opener especially with KL Rahul having shown encouraging form in the T20 series. Dhawan does have fond memories of Vidarbha Cricket Association Stadium. He has played just one ODI at the venue, incidentally against Australia in 2013, and scored a delightful 100 off 102 balls. Against the same opposition, Dhawan will be hoping to regain some of his old form. On the bowling front, India ticked most boxes with Bumrah and Shami leading the pace unit while Kuldeep, Jadhav and Ravindra Jadeja held their own with economical spells. More of the same will be expected from the bowlers come Tuesday. Australia did their best to make a match out of it in Hyderabad but 236 was never going to be enough for a power-packed Indian batting lineup. Aaron Finch's form has been a big worry for the visitors while an unsettled middle-order has further added to their woes. 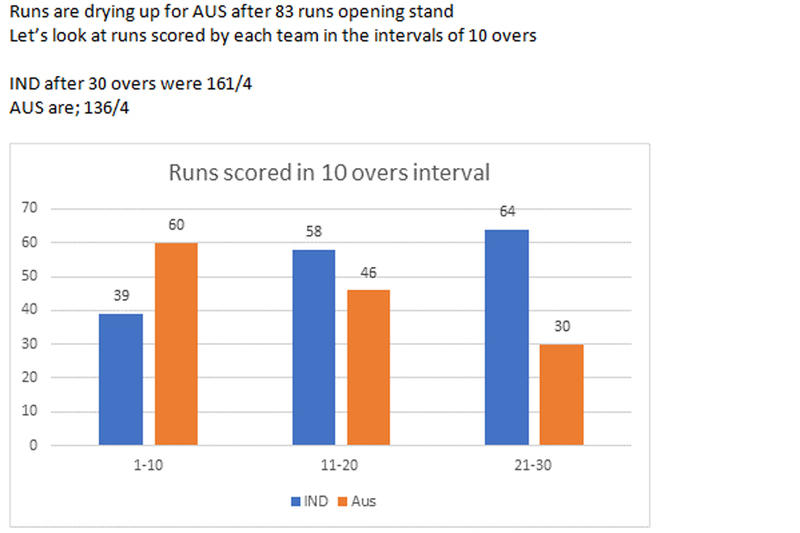 Usman Khawaja and Marcus Stoinis started off well after Finch fell for a nought but the middle-order barring Glenn Maxwell was not able to chug along consistently. Australia have won just three of 17 ODIs since the start of 2018, a winning percentage of just 17.25. That is one record they will desperately want to improve upon. They showed they have the calibre to play in the sub-continental conditions as was on display in the two T20Is. They are likely to be bolstered by the return of Shaun Marsh who was ruled out of the first ODI due to injury. His presence is bound to make the batting unit slightly stronger. Australia do not have a lot of options in the batting unit and will hope the current lot can come up with a much better show than what they did in Hyderabad. It is expected to be a pleasant day in Nagpur with temperatures hovering around the 32-degree mark. Being a day/night affair the ball is likely to nip around under lights but by and large, the VCA surface looks a good one for batsmen. India: Virat Kohli (c), Rohit Sharma, Shikhar Dhawan, Ambati Rayudu, Kedar Jadhav, MS Dhoni (wk), Ravindra Jadeja, Jasprit Bumrah, Mohamed Shami, Yuzvendra Chahal, Kuldeep Yadav, Vijay Shankar, Rishabh Pant, Sidharth Kaul, KL Rahul. Australia: Aaron Finch(c), Alex Carey (wk), Usman Khawaja, Shaun Marsh, D Arcy Short, Peter Handscomb, Marcus Stoinis, Glenn Maxwell, Jhye Richardson, Ashton Turner, Pat Cummins, Nathan Coulter-Nile, Jason Behrendorff, Nathan Lyon, Adam Zampa, Andrew Tye.